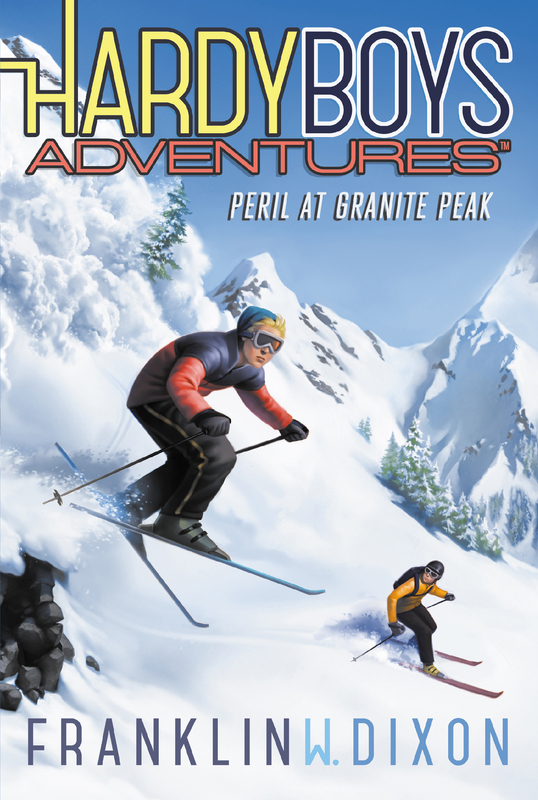 Joe and Frank’s winter break skiing holiday turns to horror in this Hardy Boys adventure—a fresh approach to a classic series. But their plans hit an unexpected bump when a blizzard blows in, closing the roads and leaving the boys stranded in the lodge with several others. Meanwhile, a series of deadly mishaps threatens to sabotage the resort—and the lives of its trapped guests. First, a fellow vacationer nearly freezes solid when he’s locked out during the raging storm. Then, the lodge’s electricity is cut off, broken glass turns up in the breakfast waffles, and a resort employee is buried in a snowdrift. Who’s behind these sinister acts? Is the culprit trapped in the lodge with them? The Hardys are determined to find out—before they’re caught in an avalanche of danger. I glanced up from adjusting my boot buckle. My ski helmet made it hard to see. But my brother was impossible to miss in his red-and-blue jacket and tricked-out mirrored goggles. He bent low over his skis, poles tucked tightly under his arms and a big grin on his face. “Learn to steer or you’ll be back on the bunny slope, hotshot!” I yelled with a laugh as he whizzed past me. Then I looked over my shoulder to check on our friend Chet Morton. Chet was the reason Joe and I were in Vermont, but that didn’t mean he was an expert skier. Not even close. My eyes widened as Chet’s skis almost crossed while he was negotiating an easy turn. He lurched and started to fall, but somehow righted himself. “Nice save, buddy!” I called helpfully. Chet turned his head and squinted at me. It looked like his goggles were crooked. He was picking up speed as he slid downhill. Chet whipped his head around just in time to see the huge spruce hurtling at him. Well, technically he was hurtling at it. Whatever. The effect would be the same if the two collided. “Turn! Turn!” Joe and I yelled at the same time. Chet leaned hard to the left, missing the tree by inches. Whew! He lost his balance immediately after that, belly flopping into a large snowdrift. Then I saw my answer. The snowdrift Chet had hit was moving. He pushed off, aiming straight down the slope. I did the same. Glancing back over my shoulder, I saw Chet scrambling to his feet on the uphill side of the moving mass of tumbling snow. Good. He was safe. Joe and me? Not so much. There was a snow-covered pile of rocks just ahead so I bent low, leaning into a tidy parallel turn to avoid it. I looked over, expecting Joe to follow. But he was still heading straight down. Too late. Joe was headed straight for the rocks! And the avalanche was coming fast. If he wiped out, he’d be buried! I held my breath as Joe reached the rock pile. He saw it a half second before he got there and bent a little lower, letting gravity take him up and over on its thin covering of snow. A second later he was airborne. One ski started to dip down, and for a second I was sure he was going to wipe out. But he recovered quickly, landing hard but squarely and then turning sharply to follow me out of the path of the avalanche. Joe was breathing hard when he caught up to me at the base of the slope. “Nice skiing, brother,” he said, lifting his fist. “Where’s Chet?” Joe peered up the slope. The avalanche was over, and we saw Chet carefully snowplowing his way down the hill. There were maybe three or four skiers visible on the various hills within our view, plus half a dozen beginners on the bunny slope over near the lodge. Other than that, we had the mountain to ourselves. I didn’t answer for a second. The White Rattlesnake did sound like fun. Maybe a little too much fun for Chet. If he’d caused an avalanche on the relatively easy green circle trail we’d just negotiated, what would he do on a trickier slope? But Chet wasn’t saying anything, so I didn’t either. Joe and I might be brothers, but that didn’t mean we always saw things the same way. He was definitely the daredevil type. Me? I liked a little adrenaline rush as much as the next guy—as long as that next guy wasn’t Joe. He already thought I was way too cautious. I didn’t want to give him more ammunition. Besides, Chet was a big boy. If he didn’t want to try the White Rattlesnake Trail, he could speak up and say so. We were a dozen yards from the lift when we heard a bark. Glancing over, I saw a guy hurrying past, head down and hands shoved into the pockets of his well-worn parka. A large black-and-tan dog was at his side. Her ears were pricked toward us, and her furry tail was wagging. Cody Gallagher was the one who’d invited us to Granite Peak Lodge. He’d been Chet’s camp counselor years ago, and the two of them had kept in touch. Cody was a few years older than us, tall and wiry with reddish-brown hair. A little quiet, but a nice guy. He’d graduated from high school a year or two earlier and now worked full-time at the lodge with his parents. His trusty Lab-shepherd mix, Blizzard, never left his side. Cody heard Chet and looked over. He was pretty far away, but for a split second it looked as if a shadow passed over his expression. Was I imagining things, or did he appear less than thrilled to see us? “A blast,” Joe replied, leaning over to rub Blizzard’s furry head. I nodded. “But listen, there was a minor avalanche on the Sugar Maple Trail just now. . . .” I quickly filled him in on what had happened. I nodded again. There was a notice hanging on the bulletin board in the lodge’s dining room, listing several ski trails that were off-limits due to weather conditions or other issues. I’d had plenty of time to study it that morning while Joe and Chet were having a third helping of bacon and eggs. There were only a few people waiting for the lifts. As we arrived, a young couple hopped into an empty car. Cody grabbed a well-worn pair of skis and poles that were leaning against the wall of the control booth. “Guess we won’t have to wait long for a lift,” Joe joked as two more skiers stepped into another lift. I shot Joe a warning look. Leave it to my brother to bring up a sore subject. We all knew that Granite Peak Lodge was having trouble attracting enough visitors—that was the main reason we were there. A couple of bigger, flashier resorts had opened on the other side of the mountain recently, and people were flocking to them. According to Cody’s dad, the skiing was better on this side of the mountain, but people liked the Wi-Fi and spa treatments and fancy gourmet food those other resorts offered. That was why Cody had e-mailed Chet a few weeks ago, urging him to come for a stay over winter break and bring all his friends. He’d even sent a discount coupon for one of the lodge’s nicest suites. Chet had been all for it. Surprisingly, so had his parents. Or maybe not so surprisingly. They were going to a wedding out of state, and I guess they preferred to ship Chet out to the lodge rather than leave him home alone. However, Joe and I were the only friends Chet could convince to tag along. I guess nobody else’s parents liked the idea of a bunch of teen guys let loose at a ski resort. That hadn’t been a problem for us, though. Mom and Dad had okayed the plan as soon as they heard about it. And I was pretty sure I knew why. See, Joe and I had this hobby—solving crimes. We’d been doing it since we were little kids. And we were good at it. We’d nabbed more than our share of bad guys, sometimes with the help of our dad, a retired police detective and private investigator. Dad didn’t always approve of our tendency to put ourselves in danger, but he’d been mostly supportive of our sleuthing. He got it, you know? But lately we’d run into some trouble. Legal trouble, mostly. Not to mention some bad feelings with the local police. Long story short, we’d had to promise to get out of the crime-solving business for good, or we’d end up in reform school. After we’d helped bust a local crime ring called the Red Arrow, though, Bayport’s police chief (and our parents) relaxed the rules, telling us we could catch a few crooks now and then as long as we agreed to keep law enforcement in the loop. Still, we were trying to keep a low profile in the crime-solving department. Truth be told, I think our parents were hoping that getting us out of Bayport for a week or two might keep our minds off mysteries for a while. And I figured they were right. What kind of trouble could we find up here? Soon we were at the front of the line. The lifts only held two people apiece. My brother and I watched as Chet and Cody headed up the mountain. A moment later we hopped onto the next lift, our skis swinging as the car rose into the crisp, cold winter air. Chet and Cody were waiting when we arrived at the top. The lift dropped us off at the edge of a large, flat clearing near the top of the hill. Several trails started there, snaking off in different directions, with large wooden signs marking the start of each one. The signs included the trail’s name, difficulty level, and a map showing its place on the mountain. A trio of twentysomething girls who’d been just ahead of us in the lift line were starting out down a black diamond trail, while a man dressed in a flashy red-and-white parka was standing nearby, adjusting his helmet and goggles. “Great day for skiing, huh?” I said as I passed him. The man turned and blinked at me through his goggles. He was in his early thirties, with pasty skin, thin brown hair poking out from under his helmet, and watery gray eyes. He turned away without bothering to respond. Whatever. I shrugged and moved on. “White Rattlesnake, here we come!” Joe exclaimed, using his poles to push himself along in the direction of the trailhead. “Hang on, I think my buckle’s loose.” Chet knelt down and fiddled with one of his boots. “Have fun, you guys,” Cody said. “I’ll catch you at dinner.” He headed toward one of the trailheads with Blizzard at his heels. While we waited for Chet, I watched the pasty-skinned man head across the clearing. He wasn’t exactly an expert skier. He almost tripped over his poles, then got his skis crossed and almost went down. I was a little surprised he wasn’t still taking lessons down on the bunny slope. As he reached one of the signs, I glanced at it. Good. It was a green circle trail—the easiest level. But my eyes widened when I took in the name on the sign: Whispering Pine Trail.